An architectural rendering of the “Knuckle Lounge” area. An architectural rendering of a semi-suite. A courtyard of the residence halls at night. The center courtyard at night. FAYETTEVILLE, Ark. 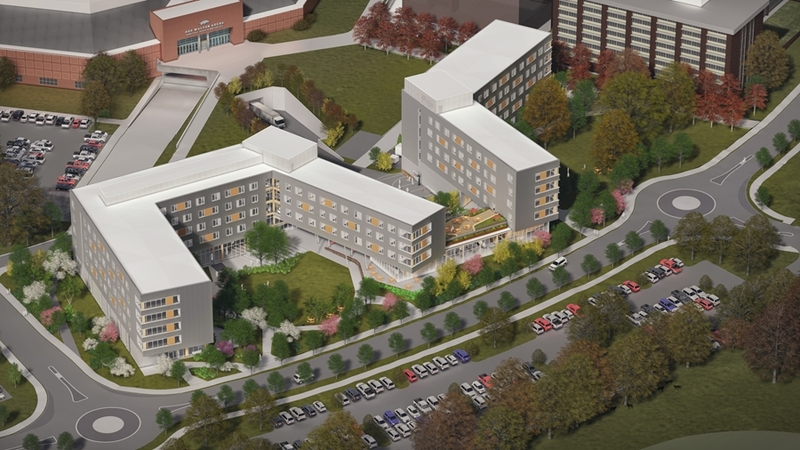 – Construction is underway on the University of Arkansas’ newest student residence halls, with the buildings scheduled to open in time for the fall 2019 semester. The Stadium Drive Residence Halls, which will be located south of Pomfret Hall and east of Bud Walton Arena, are the first new student housing additions on campus since Founders Hall opened in 2013. “Cross-laminated timber — the most prevalent form of ‘mass timber’ — is a form of ‘super-plywood,’ that is, massive panels made of layers of dimensioned lumber adhered at 90 degree angles to each other,” said Peter MacKeith, dean of the Fay Jones School. “The entire laminate meets structural, fire, seismic, health and other required building code specifications, as must any construction material — and possesses great versatility in design and construction applications. On top of that, wood is a renewable resource — forests can be sustainably managed, harvested and regrown.